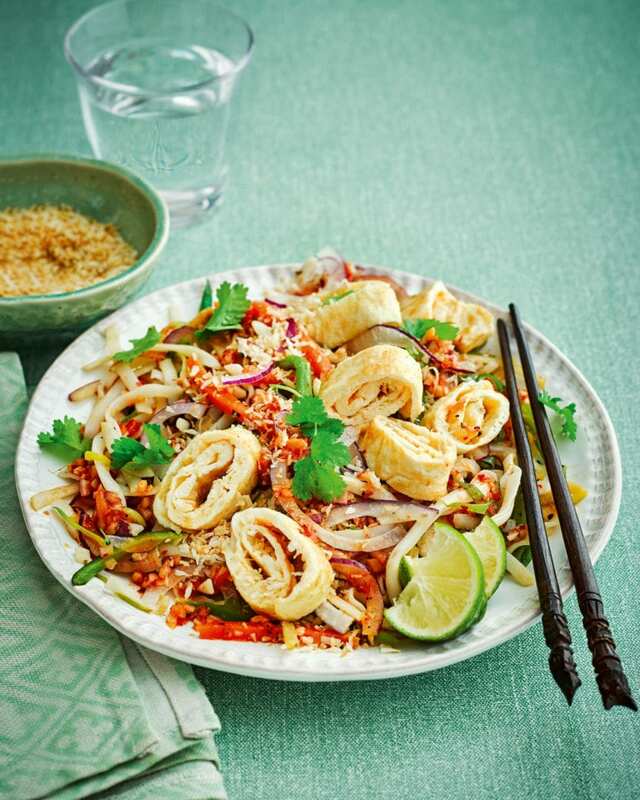 This vegetable stir-fry paired with an omelette and dressed with a spicy sambal sauce make a tasty, filling veggie supper that is ready in 15 minutes. In a small bowl, mix together all the sambal ingredients, except the sliced red onion, with salt and pepper. Set aside. Heat a large wok or large, deep frying pan with a splash of oil over a medium-high heat. Add the vegetables and stir-fry for 3-4 minutes until tender. Add the rice noodles and sambal, then toss together over the heat for a couple of minutes. Meanwhile, beat the eggs in a bowl with a splash of oil. Heat a 20cm non-stick frying pan brushed with vegetable oil over a medium-high heat. Add half the egg to the pan and cook for a few minutes, swirling the pan after 30 seconds to make a thin omelette. Once the egg is just set, tip onto a chopping board, then roll up and slice. Repeat with the remaining egg to make a second omelette. Divide the stir-fried noodles and sliced omelette among plates. Scatter over the toasted coconut and coriander, then serve with the lime wedges, if using.